South African based businessman Ivan Ssemwanga is organizing yet another boat cruise that will be held on 30th December. Two weeks back, Ivan spent over 30million on drinks, food, music and hiring a yacht that saw over 100 babes on board cruising with him as he enjoyed fish and chips. The number of babes required on board this time has increased from the previous 100 to 150 and they should be aged 20-30yrs. The boat cruise has limited seats for guys as the organisers; Ivan, Cheune and one King Lawrence say they need only 50 smart guys. They add that the guys allowed on board must be aged between 25-35years. Now much as the boat cruise is free, the 150 babes must be clad in bikinis or hot pants to qualify for the free ride. Its not yet clear how much the guys will be paying but its free for all Ugandans living abroad. 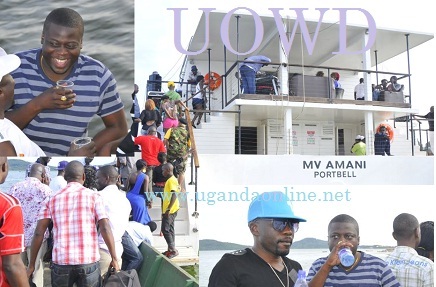 The last boat cruise set off at 4:00pm from Beach Gardens in Ggaba to Portbell, Munyonyo before making a stop over at Beer Gardens in Busoke where all those on board were given a second treat of snacks, chips and fish as the guests danced to music. The MV Amani Portbell Yacht came back to Ggaba at 7:00pm. This is when the Goodlyfe Crew started performing. Now this boat cruise of December is likely to be a lot better than the previous one because that will be more or less a celebration of a year that has been rocky for Ivan as far as his relationship with Zari is concerned. He has now resorted to chilling out with babes in bikinis, hot pants as he contemplates his next move.